This one is for Rebecca. Sure, there are good lines. It starts well: “The guilty undertaker sighs, the lonesome organ grinder cries”, but it’s all downhill from there. I planned to skip it. But this morning on the drive to work (-27C this morning, you ride your bike) Rebecca noted when it came on that this was one of her favourite Dylan songs. That seems impossible to me, and I asked why. For Rebecca this isn’t a Dylan song so much as it is a Dylan song that Bruce Springsteen covered at the Main Point in 1975, a bootleg that circulated in her house among the seven children. Rebecca explains that Springsteen understood far better than Dylan that this is not an uptempo number, but a song of desperation. So for Rebecca and her siblings, here’s The Boss breathing life into one of Dylan’s lesser numbers. 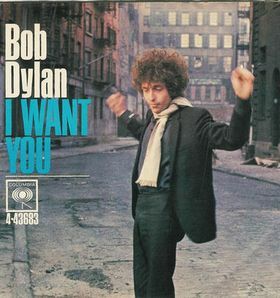 (Also, that single cover is just about the worst photo of Bob Dylan I’ve ever seen – certainly the worst up to this point). Gonna start a blog similar to yours where I listen to every song titled “I Want You”.